Sonoma Scent Studio is one of those lines that comes up on my radar – a couple of their scents get mentioned regularly by perfumistas – but, as often happens, I’d never managed to try any. I finally ordered some samples from the SSS website, and (full disclosure) perfumer Laurie Erickson threw in additional samples, so I got a sense of the range of her line. Tabac Aurea – Cedar, sandalwood, tobacco, leather, vetiver, patchouli, clove, labdanum absolute, tonka bean, amber, vanilla, musk. This is the new-ish scent that finally prompted my order, I’ve read raves and I understand why. A warm, sueded comfort scent that makes me think of Donna Karan’s Black Cashmere with a leather overlay and pipe-tobacco drydown. I could smell this all day long. Incense Pure – frankincense, myrrh, labdanum, cistus oil, natural oakmoss absolute, aged Indian patchouli heartnote fraction, sandalwood, cedar, ambergris, orris, angelica root absolute, elemi EO, vanilla absolute. With those notes, how could this smell anything other than wonderful? Resiny, like a walk in the woods; more than straight frankincense but not fussy, a perfect drop of vanilla. Winter Woods – Guaiacwood, cedar, sandalwood, birch tar, cade, oakmoss absolute, castoreum, amber, labdanum absolute, vetiver, ambergris, musk. The one I instantly wanted a bottle of, which will come as no shock to some of you, reading that notes list. There’s something quirky and humorous about the way the guaiacwood obscures the naughty bits… for awhile. It wears like a musk on me — very cuddly, surprisingly warm, not too sweet, for those of us who long for a dirtier Muscs Koublai Khan. Jour Ensoleille – orange blossom, neroli, tuberose, jasmine, beeswax absolute, labdanum absolute, myrrh, sandalwood, ambergris, vetiver, green leaves, oakmoss. This doesn’t fit with the theme of winter comfort-scents which I chose for my post, but I feel I’d be remiss not mentioning this, because WOW. An intensely indolic orange blossom/jasmine, a dollop of furry golden beeswax, balanced by the liquid-absinthe greenness of vetiver and oakmoss. I hope you get what I’m getting, which is less golden-sunlit afternoon and more tumble-in-the-haystack-with-the-miller’s-son. Probably not work-friendly, unless you work as either the randy goat-heard or the innkeeper’s saucy serving wench. The most interesting small perfumers develop their own style, with an array of scents that hang together and “feel” like their work and nobody else’s. Coming fresh to Laurie Erickson’s scents, I enjoyed how unsweet they are, and how (at least in the more winter-y ones I tried) she’s got a fondness for leather, woods and smoke, but they don’t all end up smelling like slight variations of each other; they’re distinct and attractive scents. (She’s got more summery things and seems to have an affinity for violet, heliotrope and rose.) I was pleasantly surprised by how ripe many of these smelled. She uses labdanum, ambergris, oakmoss, musk and castoreum with a generous hand. I’d recommend this line for those of you who like your winter comfort a little darker and less sweet, can tolerate some skank, and are willing (with the oil format) to wait a minute or two for the scents to set up. I know a number of you have sampled Sonoma Scent Studio – please name your favorites in comments. Also, don’t be shy, if you’ve blogged on them, add your links! As far as I’m concerned, the more the merrier. I haven’t yet tried all of the SSS scents, but I have been impressed with most of them, even if they didn’t quite work for me. Looks like I’ve only reviewed Champagne de Bois properly, and done one quickie smitten post on my dear Tabac Aurea: http://museinwoodenshoes.wordpress.com/category/sonoma-scent-studio/ Tabac Aurea is still rockin’ my world, though I tried it first from a 1/3 full sample vial more than a year ago. I like Velvet Rose a lot too – nicest “big armful of scarlet roses” scent I’ve ever tried. And you might remember I’m a Rose Ho, so there have been quite a few. One I haven’t tried, but have wanted to get my mitts on, is Jour Ensoleille – but I admit that “indolic OB/jasmine” really, really turns down the volume on my Want. I don’t get on well with either OB or jasmine, so that might not do. And Vintage Rose, although the notes list calls my name, is an absolute disaster on me. Each time I try it, I’ve had to scrub within 12 minutes or less – it *smells* fine, but there’s something in there that just turns my stomach. It works like whatever-it-is in the Lauder base that nauseates me. Have been eagerly awaiting her Bouquet Blanc fragrance, which I know she’s still working on (but which will probably have to be renamed, because of the Le Labo/Anthropologie scent by that name). Mals do try Jour – I *wish* that I had gotten indolic OB and jasmine, but not on my skin. It was much more tuberose/white floral. Oh, GOOD. More tuberose is always a good thing. I wonder if different batches end up smelling slightly differently? It was all, hellooo sailor on me! Hehehehee…. I want what she’s having. Isn’t that funny — Winter Woods wasn’t that smokey on me at all, just a little! That Tabac is delicious. I’m not joking, TA smells persackly (well, near enough) like my high school boyfriend. Whoa. I love Sonoma Scent Studio! It wasn’t that long ago that I first experienced Laurie’s scents, and I’ve since become a huge personal fan. Thank you March for talking about them! Mals; I don’t get any skank at all out of JE—to me, it’s just golden sunshine all the way. I’ve been wearing Laurie’s scents for ages, going back to the time she was making dupes. Her Chaos dupe was spot on. I think Incense Pure is one of the best things she has done to date. On me it is austere, dry and what I wanted Karan’s Incense to be. Laurie’s Incense Pure is strong and direct but very wearable. I could stop a few lanes of traffic, comatize a full elevator or clear a whole restaurant with one miniscule spritz of Karan’s Incense. I love the fact that she uses vanilla minimally, if at all. Laurie (as anyone knows who has gotten to know her even a bit) is a wonderful, kind, generous and friendly artist-kind of a “perfumer next door” and in the same ken as Dawn Spencer Horowitz and Andy Tauer. I only wish she would make some intensely galbanum things. I can hope. There is galbanum in the new classic scent that she is working on! Wait for it!! DK Incense is a whole lot; I prefer Ceremony. But I’d prefer Incense Pure to either of those. Never tried her Chaos dupe; Irma Shorell’s Anarchy (which has been d/c’d) was excellent. This is the first time I am visiting your Blog and I really liked the content of your articles. We can see how much you like fragances. Now you’ve got me very eager to sample these soon… especially the tabac aurea and the incense pure! The back and forth overseas works pretty well. To be honest the only trouble I’ve had is with Canada. Don’t be afraid to order over seas! I ordered a bottle of Tabac Aurea and some samples, they were shipped to Sweden within a week without any hassle what so ever. I contacted her in advance, just to make sure about costs of shipping etc, it was all very reasonable and great, great customer service. I see some sampling in my future….especially the Wnter Woods and Incense. Can. Not. Get. Enough. Incense! Love the Montale Full Incense so much! Just a random question here, what would you recommend that is similar to Kenzo Amour Le Parfum and Organza Indecense?? I see what you mean. I looked at a few woody comfort scents in the perfume guide but TSanchez and LTurin seem to always be giving them very poor rating, except for Chanel’s Bois des Iles, which I would love to buy and could afford perhaps if it was sold in smaller than 200ml bottles. I don’t think Turin likes woodsy perfume as a matter of fact, he seems to be more into florals, but I may be wrong. If you think of anything woodsy and comforting along the lines of Organza Indecence that has not been reformulated recently, please let me know. oooh that’s uncanny….I just ordered a bottle of Champagne de Bois yesterday after e mailing a very gracious Laurie. It’s the first bottle I’ve ordered in ages but my sample haunted me- especially the delicious drydown. I wish I’d read this first March and thrown in some samples. I did have the incense sample which was OK, but I seem to like the more hollow incenses like Timbuktu nad Incense Extreme. Any one else love CdeB? CdB always sets me aright– it’s awesome in the winter, poofing up from your sweater in the cold! Yay SSS! I received decants of Tabac Aurea, Winter Woods and Cameo in Swapmania and now a sample set is in my future. I ADORE both TA and WW ( Cameo is beautiful but totally not for me )and with the snow here Winter Woods has been getting a lot of love. I too love incense and now I really want to try Incense Pure and Fireside Intense. Once we’ve recovered for Christmas, I will be placing an order! Dawn said Winter Woods was one of her favorites. I wore the Tabac today and am thinking I might need more. My Evil Scent Twin sent me samples of several SSS scents a few months ago and that was that! Hooray for swapping and ES Twins. Violets are hard — they can be too powdery or too sweet. Hers sounds very nice; I’m sorry I missed it. I love her Voile de Violette – not sweet or powdery at all. And my skin amps sweet! I heard she’s reworking the old Lieu de Reves, but the old one is one of the few violets I like– magical and unicorn-like, very girly but mysterious. I also love many of Laurie’s perfumes, but I tend to like her softer florals like Lieu de Reves. She is working on a new version of Lieu de Reves that is amazing. It’s a little more complex than the original, but still utterly gorgeous. She’s going to sell this one through Indiescents.com. I plan to snap up a bottle as soon as it’s available. Also checking in to say I’m a major SSS fan! Champagne de Bois is one of my top five, no three, scents! Absolutely could not be without it. It is not at all intimidated by my precious bottles of vintage Guerlain extraits! I have a FB of Incense Pure and keep a sample vial on my desk as it is such a beautiful, calming scent. I also own a bottle of Cameo, strange considering that I am *not* a rose lover. But it manages to be both romantic, old fashioned and dry at the same time. Laurie is working on a couple of new ones – she’s blogged about them – and I’m lucky enough to be one of her testers. While the new Lieu is indeed beautiful, the new classic style scent is off the charts! It has literally haunted my scent memory and I cannot wait until it goes into production. It is the best new scent I’ve smelled in years! Great reviews! Did you try Amber Noir? I would think you’d like that one a lot. I haven’t tried the Cameo (she threw one in) because … :-ss but I will. I didn’t try the Amber because really sweet ambers make me a bit queasy, but now that I have a feel for her scents, I’d probably like it. Rappleyea, I’m so envious of your tester job! I can’t wait to try this new one. I know… I should pay her! The only bottle I have is Lieu de Reves which I bought after a review by helg on Perfumeshrine whetted my appetite. No problems ordering from the US, by the way. Laurie was extremely accommodating. This, and others I’ve sampled, have been really lovely scents. I should really re-visit my samples and get to know more of her other confections. I’ve got quite a few of Laurie’s scents, and love them all. My favourites are Vintage Rose and Tabac Aurea, but I also luuurrrve Winter Woods, Encens Tranquille, Ambre Noir, Incense Pure, Wood Violet…. well, like I said, I love them all. And they last! Last night I dabbed on a bit of Incense Pure from my sample. This morning I woke up from a dream about a forest, wondering what the lovely smell was. And I just won a draw at her blog for some purse sprays, so I’m a happy bunny! Yes! 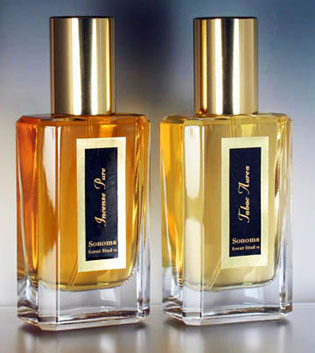 I discovered SSS about a year ago and love Champagne des Bois and the violet scents (one woodier, one greener). We have Tabac Aurea as well, though I tend to not wear it to work (and husband, a unlit tobacco fan, uses it to refresh his loose tobacco office potpourri [it works!]). I also get a good day of scenting from any of these, so they’re perfect for business trips and all day wear. It sounds like I really need to try the Champagne de Bois. I love Sonoma Scent Studio’s musks and will be looking forward to the new scents! The main note to me all the way through is nutmeg, and it totally works: warm and woody, just this side of vanilla but not food-ey. Wonderful! I am fortunate to have some of Laurie’s terrific fragrances. She’s one impressively talented perfumer! I enjoyed reading this thoughtful article. It’s so interesting that you posted this, because I just recently tried this line for the first time – I was on a violet kick and someone recced Jour en Soleille, I think, and I took the opportunity to get samples of the ones I’d heard about the most, including Champagne des Bois. Sadly, I didn’t love ANY of them! I’m wondering now if there’s a sort of sweetness I expect that they don’t have. They just struck me as bland, uninteresting. Good blends – it wasn’t as though I felt overwhelmed by any one note – but the mix together making something that I knew I should like but just didn’t, like medieval descant music. I’m going to try them again when it’s warmer, though, as almost everything has been disappearing so quickly on me these days – my skin is dry and so is the air and most of my favorite perfumes are wearing on me like echoes of themselves shouting down a long dark tunnel. It’s hard to say, if none of them worked on you, but of course there are plenty of other fish in the sea… they lasted quite well on me, but things usually do. I have been wanting to try Tabac Aurea! I have a bottle of Fireside and WANT a bottle of Champagne de Bois. Wood Violet is beautiful too. Glad you got to try this special pefume line. I’m happy to see so many of the fans on here today. Fireside Intense is one of my top five scents. It’s what I wore for a whole week on the Scent Challenge, and I’m glad to see it getting more attention. Love the leather note in it. You’ve already mentioned many of my favorites from this line, but I also love her Ambre Noire and her Voile de Violette. The Ambre Noire I think you would really like. Didn’t you like the original Prada? It’s similar, but better IMHO. Having read a bit more about it, perhaps I’ll try the Ambre, which doesn’t sound scary sweet. Hoarding my preciousssss bottles of CdB and the original ETranquille. Ha! Two teeny spritzes of CdB about two hours before! The I went and got lunch and my blood sugar returned to normal. They two were obviously perfume heathens! Bet you smelled gorgeous! Oooh yeah shame on you, wearing scent to a natural food store! Oh my gosh, Kristen. I had the exact opposite experience wearing a SSS scent to the health food store. Two women working there stopped to ask what I was wearing, how to get it, and even took out some paper and a pencil to write it down! It was Sienna Musk, btw. SO lovely. Those are not my only two SSS bottles–I have seven–thanks, Laurie! Tabac Aurea is a staple tobacco for me. I think anybody who has found themselves fond of tobacco scents would be doing themselves a favor in trying this one. Absolute comfort for me, and easy to wear for a variety of clothings/situations. I’ve come to trust Laurie’s work. She’s the kind of perfumer that I’d feel comfortable exploring my “don’t tend to go there” places with, just to see what’s she’s doing there. This might have to be my Christmas present to myself.. I hear you. Laughing, but I hear you. I’m going with “earthy” and “barnyard.” But as I noted, it made me smile. MKK is … just not dirty on me, I swear. You might at least try it. You and I are two of the people who find MKK very tame. I think it smells a lot like the Kiehls musk, to be honest. I’m a big fan of Femme Jolie which is, sadly, discontinued. Sienna Musk is probably my next favorite. Nicely spicy without being too much. Since I’m not a fan of tobacco or smoke, I’ve avoided scents like Tabac Aurea, Winter Woods, etc. Besides being a talented perfumer, Laurie’s customer service is top notch and delivery has been lightning fast in the past. Mals: It is and it isn’t (on the web site). The name is there but when you click the link it brings up the same page. I confirmed with Laurie a few months back that she intends to discontinue it. Ah. That one didn’t work for me, anyway, but I knew I’d at least seen the name on the site. Oh, that’s too bad, I liked my sample. March – So glad you mentioned Jour Ensoleille, My SSS HG. This one is very very special, and seems to fall under the radar for many in favor of her wonderful woodsy and incensy fragrances. Makes me smile every time! None of those naughty notes on me though…. Oh, lucky you. I’m still puzzled as to what’s in VR that bothers me so much, because the list of notes is benign. Laurie told me once that Vintage Rose was one of the very few fragrances of hers that she used iso e super in. I wonder if that’s what bothers you. It sure bothers me! I own Incense Pure, and it’s probably my favorite incense out of my over-represented incenses. So impressed. I really do want to try more, so I’m glad you reviewed these. I’ve heard the buzz about Tabac Aurea, but Winter Woods sounds pretty incredible. A dirtier MKK? Yes, please. Well, YMMV. Someone up there said Winter Woods has “the teensiest bit of sh–,” which I guess is… true. I own Incense Pure, Winter Woods and Femme Jolie – wore it yesterday – with plans to buy Champagne de Bois, Vintage Rose (I did a wrist-to-wrist comparison between it and Parfum Sacre to see how it stood up – they were BOTH fabulous ;)) and Jour Ensoleille. And heck…. I wouldn’t turn down bottles of Ambre Noir, Sienna Musk and Wood Violet. Tabac Aurea didn’t work for me, but then tobacco in general doesn’t. And like mals, there’s lots of smoke in my Winter Woods, so Fireside and Fireside Intense were just tooooo much. Cameo and Lieu de Reves were lovely, but not my style at all, and the jury’s still out for Voile de Violette. I’ll revisit that one in the spring. And may I also commend Laurie’s amazing customer service? I live in oh-so-annoying-to-ship-to Canada, and she’s really made extra efforts to send stuff to me. I wonder if I’m the smoke-killer? And also what is the DEAL with shipping to Canada? Canada is the only place my packages drag. Beautiful line, tons of naturals, potent and long-lasting. There very few of Laurie’s scents that I don’t like! Vintage Rose, Tabac Aurea, Ambre Noir, Champagne de Bois top the list, though. Laurie’s fragrances are a bargain. They wear like parfum concentration. It was a shock to go from just dabbing samples to spraying from a FB of Jolie Femme. And they last a long time, as people have been mentioning. Tabac Aurea is the first tobacco I’ve really liked, so if you’re generally not a fan of tobaccos, it’s still worth a try. I just dabbed some on so I could join in the spirit of the post! I should have said that about the Tabac Aurea. I like the idea of tobacco scents but don’t wear them much. It’s like wearing a beard, or something. This one I would totally wear. I ordered a bottle of Tabac Aurea unsniffed based on all the rave comments here and at NST. I know I committed one of the seven deadly perfumista sins, but I do throw caution to the winds every now and then, and Haunani likes Tabac Aurea, so I was pretty sure I would, too. And I do, I totally love it! It does not smell like tobacco to me, but rather resinous woods and other good things. Rather like Via del Profumo Mecca Balsam, which I also love, and the core of my fav classic vintage Guerlains. I have samples of others, thanks to kind Rapple and Tammy, and plan to test them with concentration, since there must be other wonders from the creator of the beautiful Tabac Aurea. Hehe on the unsniffed purchase! But every now and again I think it’s fun to throw caution to the wind … I’m sorry you’re not getting more of the tobacco, I get a ton. But anything that reads like Mecca Balsam isn’t all bad. I liked Tabac Aurea enough to order a bottle; I suspect anyone who like SL Fumerie Turque might want to try this one. March – Laurie may have mentioned that she’s very sensitive on the sweetness issues for a lot of her clients. That’s why she tries to keep the sweetness in check for most of her fragrances. My first comment on this site, tho’ I’m a long-term lurker. I liked Jour Ensoleille enormously when I first tried it, but it is so STRONG. For me, something rather harsh and pine-y emerges out of JE that, depending on my mood, sets me on edge somewhat. And yet it is a fascinating scent. I can’t ignore it. Femme Jolie is by a long way my favourite SSS – the balance of fruit, spice and cedar gives me such pleasure. I bought a back-up bottle a while ago, in anticipation of it being discontinued. Laurie may still have a bit left if anyone wants to as her, but she did tell me that she won’t be making any more. I just tried Incense Pure for the first time (thank you Perfume Posse swappers!) and it’s fantastic. On first spritz it smells almost exactly like Ormonde Jayne Woman, which to me means it smells *exactly* like fresh lemon zest. Then it slowly develops into a scent that is still similar but just slightly more incense-y than Woman. I’m off to order more samples now!